1.3 So what exactly is a dog fan? 1.4 So why do you need a fan for your dog? 1.5 Heat Stroke in Dogs: How Common Is It? 1.7 What are the Best Dog Cooling Fans for Home? Why Dog Fans? Dogs love spending time outdoors, but even more so in the summertime, where the weather’s beautiful and the heat of the sun is blazing in its full glory. If we feel uncomfortable when it’s hot and humid, imagine how our beloved dogs feel with their coat of fur and their inability to sweat. When humans feel hot, we sweat to cool our bodies. Sadly, dogs don’t have sweat glands, except for a few on their pads and nose, which means they lack the ability to cool themselves on their own. Dogs cool themselves primarily by panting, but sometimes, when the weather’s too hot, it’s no longer enough and dog owners have to step in. 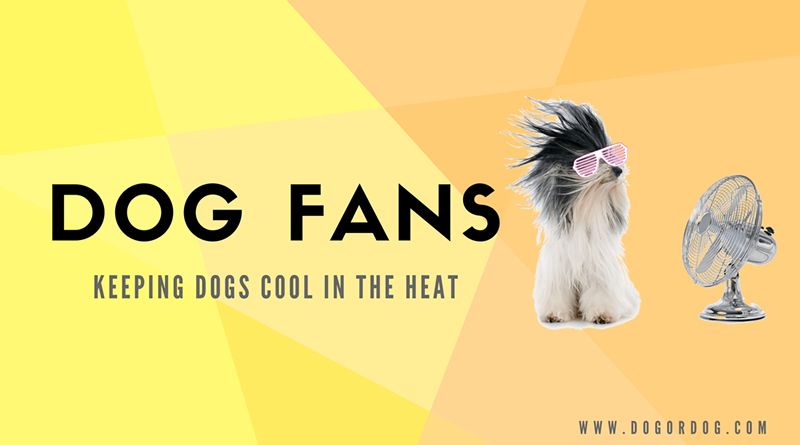 There are many ways you can help to cool down your dog, one of which, are dog fans. These fans are just like your average household fans, which help to circulate cool air into a room, but don’t make use of blades to do so. Fans for dogs must be bladeless, giving you the peace of mind that although you’re not beside them 100% of the time, they remain safe and cool and free from heat stroke. As mentioned, there are many ways to cool down your dog, some of which will be discussed further in the article. But dog fans, which may be something new to most dog owners, may just be the most helpful device you can have to make sure your dog is safe and cool indoors, even when you’re not around. So what exactly is a dog fan? Dog fans are bladeless fans that don’t make use of regular blades. Using innovative technology, most bladeless fan manufacturers have patented technologies which allow their devices to keep a room comfortable and cool for both dogs and humans. Fans don’t actually create cool air but they move around warm air from their surroundings and allow cooler air to circulate. This means fans don’t decrease a room’s temperature, but they move warm air away from you, keeping you comfortable. As for dogs, fans help to keep them comfortable, not by decreasing their body temperature, but by helping to bring cooler air into their bodies. So why do you need a fan for your dog? Sure, your dog can pant or drink cold water to keep themselves cool but during summertime, the heat can become unbearable, increasing the risk for heat stroke. Yes, dogs can suffer from heat stroke just like humans but they are more at risk from suffering this fate due to their fur. While we may feel hot during a hot summer day, it can be difficult for us to gauge whether or not our dog is suffering from the very same temperatures as we are. And sometimes, it can be too late for us to notice our dogs are already suffering. Heat Stroke in Dogs: How Common Is It? Dogs who have compromised health are at a greater risk for developing heat stroke, which is a tragic yet preventable condition through the use of certain methods to increase their temperature. A study published on the US National Library of Medicine National Institutes of Health in 2006 reveals the dangers and risks of heat stroke in dogs. The study, which was conducted by researchers Bruchim, and others, involved the cases of 54 dogs who suffered from heat stroke. Among the 54 dogs, 63% suffered heat stroke due to exertional and environmental factors, which means they suffered the condition because of their physical activity and the heat of their surroundings. The study was also conducted during the summer season, which lasted from June to August. The study concluded there was a mortality rate of 50% among the cases, where 27 of the 54 dogs succumbed to death due to heat stroke. Among the factors that lead to the deaths include delayed admission, obesity, and seizures. In conclusion, Bruchim and others, concluded the study with their findings that heat stroke in dogs could lead to serious health complications and high fatality despite treatment efforts. In a nutshell, dog fans are crucial to helping cool down your dog when it’s too hot indoors, thus, helping to eliminate the possibility of your pet from suffering from the perils of heat stroke. 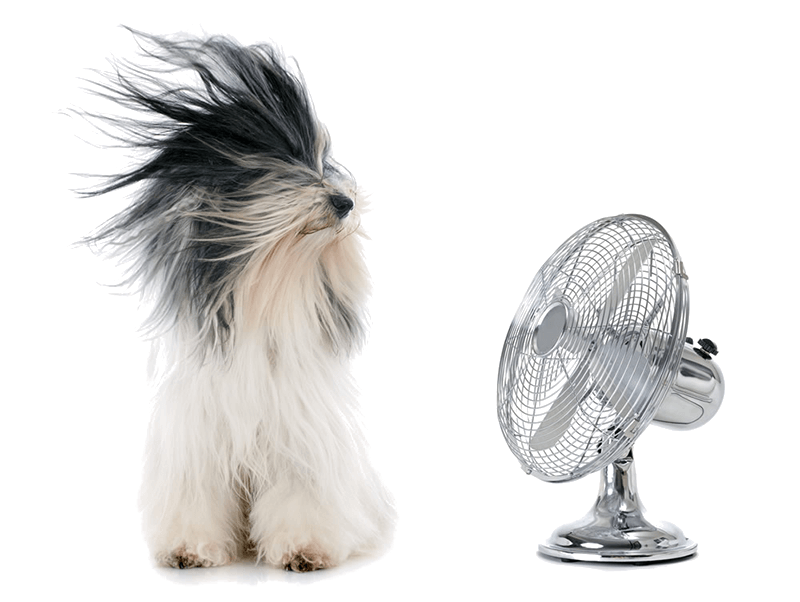 What are the Best Dog Cooling Fans for Home? If the concept of bladeless dog fans is something new to you, don’t worry, it’s a fairly new innovation that most people don’t know about. To give you an idea about how they work, these bladeless fans for dogs aren’t exactly bladeless per se. They seem bladeless since the devices don’t show any blades but they actually do. These bladeless fans for dogs do have blades but they’re mostly hidden, most of the time, on the base of the fan. These blades draw air into the base, where the air is multiplied and released as a powerful stream of air. So while there are no blades found on the fan externally, they still do contain some blades inside for them to work. So where do you begin to find and choose a bladeless fan for your dog? Dyson is considered to be the inventor and pioneer of the bladeless fan. This version is the brand’s 6th model, with its sleek and forward-thinking circular design, and being 75% quieter than their very first model. This fan is a sight to behold – it’s modern-looking, sleek, and just simply beautiful. It fits in any contemporary space, and best of all, there are no visible blades for your dog to get curious and play with. If it topples over, there’s no fear of the blades coming undone and hurting your dog – it’s completely safe in that department. The fan also features a vanishing LED display, so there are no visible buttons that your dog can accidentally press. And oh, it comes with a remote control so it’s incredibly convenient. controls on the unit is limited to an on and off button. If you lose the remote, it can be almost impossible to operate the device. The 7th version of the Dyson bladeless fan, this tower fan is another beautiful offering from the pioneers in the market. It features 10 airflow settings, a sleep timer, and an oscillation control, where you can direct airflow around a room with just one touch of the oscillation button. Because the technology used is bladeless, the airflow is smooth and constant, creating a cool and comfortable atmosphere for your dog. Featuring a patented blower technology, and fresh ion technology, the Lasko AC600 is a state-of-the-art bladeless fan that brings in the muscle in terms of powerful airflow. Let’s start with its patented blower technology. First of all, it’s quiet, so no one’s sleep will be disturbed with this device, nor will it be distracting if you need to do some work at home. Second, the blower technology packs up more than 30% more airflow than traditional tower fans, giving you and your dog more comfort in a hot room. And then there’s the fresh ion technology, which works to refresh the air around you, helping to clean the air around your dog – which is especially helpful if your pet is currently suffering from a stuffy nose or a cough or cold. With these technologies in mind, this bladeless fan is definitely one of the top choices out there. If you’re looking for a bladeless fan to move around the house, this model definitely fits the bill. Unlike other fans, this device features a handle that allows you to carry it from room to room. So if you’re working in your garage while its scorching hot and your dog follows you around, this certainly is the best option for you. Aside from its portability, it features a high-powered motor, 3 speed settings, and directional louvres so not only will your dog enjoy a powerful stream of air, but you, as well. Another futuristic-looking bladeless fan, this is one device that features 90-degrees oscillation, allowing air circulation throughout the entire room. It can tilt vertically and horizontally, and you can operate the fan with the use of a remote. So if you’re watching TV and your dog moves to a certain spot, you can still keep him cool without moving one bit – simply press a button on the remote. It also works on just 2 watts of power without compromising the volume of air to keep your room cool and comfortable. So there you have it, 5 bladeless dog fans that are sure to help lower the risk of heat stroke in your dog during the summer, or whenever it’s especially hot and humid in your home. Aside from a reliable bladeless fan, there are other products that can help to cool down your dog. Along with a dog fan, these products will help you ensure your dog is safe, healthy, and free from the deadly heat stroke. It’s great the you allow your dog to run around your yard but you have to provide them easy access to the inside of your home by installing a doggie door, as well as having their very own shelter outside. A well-ventilated and insulated dog house is perfect to place under the shade of a tree, giving a cool place for your dog to rest while still being outside. An open-air canopy is another great idea, just make sure it’s placed under some shade. Dogs love to take a dip in cool water, so why not buy them their very own dog pool? If not an actual dog pool, a large tub or molded plastic kiddie pool will do, as long as you can fill it up with water and your dog can fit inside. And again, always place the pool in a cool, shaded area. If your floor is tiled, do you notice how your dog loves lying on the floor, rolling around, and even dozing off while on the floor? It’s because tiled floors are cool, lowering their temperature. A cooling dog bed acts the same way, it lowers your dog’s temperature through the effects of a gel-like material that cools upon contact with your dog’s warm body. What’s great about these beds is that you can take it with you – to the park or even the beach, so your dog stays comfortable and cool even while you hit the beach or have an afternoon picnic. Cooling dog vests are made of the same material as dog beds, but these vests are worn on your dog’s body. What’s great about these is that your dog can pretty much run around and do whatever he wants under the heat of the sun while still staying cool. The vests pull excess heat from your dog’s body and distributes coolness such as the chest, neck, and stomach, where they experience heat the most. There are two types of cooling dog collars – one where you fill it with ice, and another where it contains the very same gel-like material in cooling dog beds and vests. With ice, you place the collar in the freezer and it melts when in contact with your dog’s neck, making your dog cool and refreshed. With the gel-like material, it acts just like vests, melting and cooling your dog as its warm skin makes contact with the collar. While vests, beds, and collars are great options for your dog, a dog fan is a better option if you stay inside the house. Some dogs won’t like wearing a vest or collar, or stay in a bed that’s new to them, but a fan simply makes the room cooler, and there’s no inconvenience on your dog’s part, since you won’t be forcing him or her to wear something new. Aside from helping to reduce the risk of heat stroke, dog fans help to improve your dog’s mood, so not only is your dog healthy, he’s also comfortable staying indoors. Heat stroke can be fatal but it’s a completely preventable condition simply by helping to cool down your dog. A bladeless dog fan, with its impressive safety features and powerful stream of constant and smooth air, is one of the best options to beat heat stroke for your dog.